A City Neighboring Earth, (مدينة مجاورة الأرض) by Jorj Abu Mhayya, Dar Onboz, Lebanon. 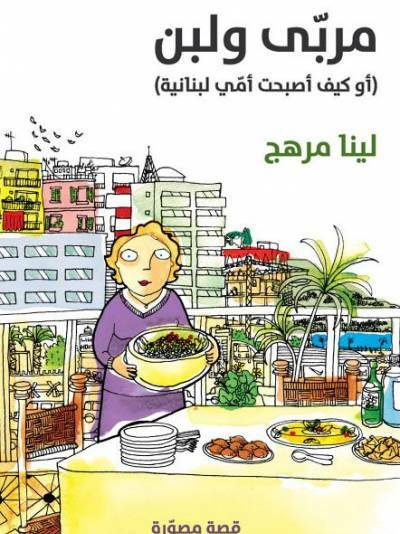 This won the prestigious 2012 International Comics Book Festival of Algeria (FIBDA) book award for a work in Arabic. See more here. 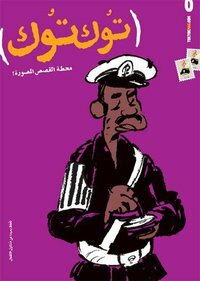 Metro (مترو), by Magdy al-Shafee, published by The Comic Shop. This fast-paced genre fiction shows us a world of corruption, sexual harassment, and hopelessness, and faced banning, fines, and its own harassment from the Egyptian government. It is now finally available in Arabic again in Cairo, in addition to English and Italian. Apartment in Bab El-Louk (في شقة باب اللوق) by Donia Maher, Ganzeer, and Ahmed Nady. This is a beautiful noir-esque work that’s as much poetry as prose, and Ganzeer asserts that this isn’t a graphic novel. He said in a previous interview, “I would never attempt to pass “The Apartment in Bab El-Louk” as a graphic novel or anything remotely close to it. Just because there are drawings, doesn’t make it a comic book or graphic novel. The sequentiality that would exist on a singular page of your typical graphic novel is nowhere to be seen in this particular book, save for the very last nine pages illustrated by Ahmad Nady. An entire story told in full-page splashes just isn’t a graphic novel. The narration is a little bit more designy, making the book more of a visual album of sorts. Or as you eloquently put it: ‘a fabulous noir poem. The Use of Life, (استخدام الحياة), by Ahmed Naje. Between a novel and a graphic novel, illustrated by Ayman al-Zargani. More on Goodreads.e, here about her mother. I can’t believe I neglected to list this; thanks to Rania Hussein Amin. Ruins of the Future, (أطلال المستقبل ), by Ganzeer/Mohamed Fahmy. Set at the Giza pyramids in the future, Ruins of the Future pits a group of scholars against an incarnation of the ancient Egyptian god Seth, and is described by its authors as “an 80-page piece of sci-fi pulp.” I’m not sure this is available any longer. A Bit of Air (حبة هوا), by Walid Taher. All right, this isn’t a graphic novel at all, but a collection of cartoons, but one could call it more of a graphic poetry collection. Dar El Shorouk. This Story Passes (هذه القصة تجري), by Mazen Kerbaj, published by Dar al Adab. Also a collection of comic strips rather than a novel, but by the fantastically talented Kerbaj, who has done his more recent graphic-novelling in French. Thanks to Francesca Gilli. Pass By Tomorrow (فوت علينا بكرة), by Sherif Adel, which is also available digitally, and has a frequently updated Facebook pace. TokTok (http://www.toktokmag.com/). The premeire Egyptian graphic-novel magazine for adults. Samandal (http://www.samandal.org/). Ditto Lebanon, although this magazine is trilingual. 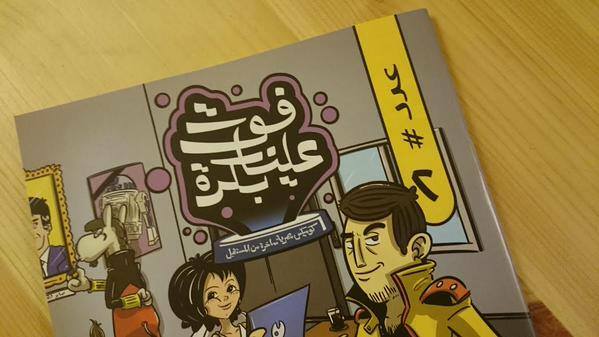 Skefkef (سكفكف), a “mutant” collection by young Moroccan comic artists, now with two editions. More on Facebook. Jewelry Box (الشكمجية). A newer feminist-collective comix initiative, mentioned here in the NYTimes. 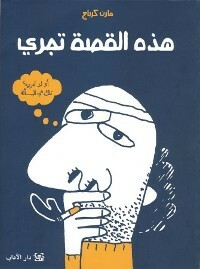 Out of Control (خارج السيطرة), published by Dar al-Ain, ed. Rania Amin. A mixed bag, but there is charm in a number of the pieces, including Sally Abd el-Aziz’s anti-romance “Badreya” and Amin’s own short piece. Les Déchainés, published by Dalimen editions. Among the works is “Fatma’s Memories,” (ذكريات فاطمة ), by Safia Ouarezki and Mahmoud Benameur. This work, set in 1942, traces the story of a dreamy young girl made to marry her cousin Amar. Amar soon leaves to fight for and in Europe, and American troops are posted in the village soon after. Written in Darija. Budrus (بدرس ), created by Irene Nasser. This short work, for emerging readers, is based on the documentary Budrus (directed by Julia Bacha), and looks at a village protest movement through the eyes of 15-year-old Iltezam Morrar. There are a number of interesting comic artists to follow online, and among blogs, certainly Oum Cartoon is a must-read.